Have you ever been to Dungeness? I have, twice now. I’d be happy to go again because there’s nowhere quite like it. It’s made of gravel, you see. Miles of gravel with bits of grass growing on it. There are houses on the gravel, all made of wood and looking a bit battered. There are abandoned fishing boats on the gravel. There are rusting shipping containers dotted around randomly on the gravel. There are brick-built kilns standing on their own in a desert of gravel. There’s a miniature railway with tiny steam trains. There’s a lighthouse with a fog horn that makes a really loud beeping sound. There’s a massive nuclear power station. Everything is grey. And I really can’t emphasise enough that there’s lots of gravel. It’s fascinating and lonely and strange. While I enjoyed being there, and will probably go again one day when I’m bored, it’s quite grim – the most beautiful and pure grimness anywhere in the world. Visit today! Dungeness, the Capital of Grim. I have a feeling that North Tyneside Council may be on to you about this post. We have known for sometime that Whitley Bay is the Capital of Grim, what makes you think this upstart has what it takes to de-throne the ‘Bay? You’re right. I’ve been taken in by their irresistible marketing. It’s a sad world where seaside locations are competing to be the most grim. I’d say that this plucky pretender to the throne does have some keen qualities that would elevate it above the standard representation of grim, however because it is based down in the South of England it immediately loses points for being soft. It’s not very soft. It’s made of gravel. Gravel is quite soft when compared to good old northern rocks, if not individually, then at least in its collectively malleable nature. I don’t wish to take sides in what appears to be an escalating conflict between Dungeness and Shitley Bay, but it has to be a concern for Shitley that it doesn’t have its own nuclear power station, and the potential for Dungeness to be plunged into centuries of isolation by a Chernobyl-style nuclear disaster must be one of its big grim selling points. Yeah but does it have a swimming club that is so disturbing nobody wants to be part of of? I don’t know. If it does, that swimming club must just meet informally on the gravel, because they don’t have a building that looks like the set of a horror film. 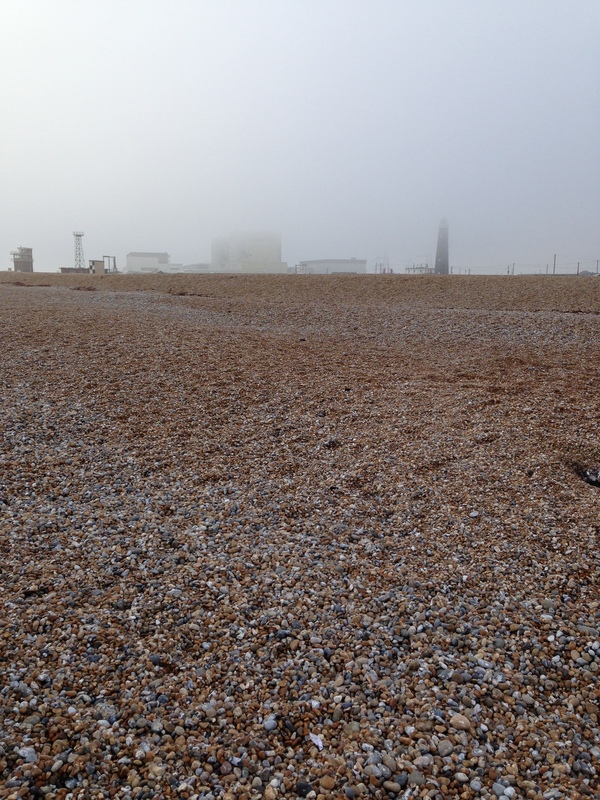 Presumably if people want to get changed at Dungeness they just recede into the fog where nobody can see them. I expect that there was a swimming club, and a sewing circle, and a marching band but because there was so much fog and grim you couldn’t see any of them. There was an entire world on the other side and you were unable to penetrate it because you were just too damn happy. Yes. I think that’s likely. The fog of my joy and delight got in the way. I can always see much further when I’m sad. You know what they say: sadness is like a telescope. I’ve been to Shitley Bay so much that my eyes of joy just burn right through the grim. People call me Joy Eyes. I’ve the jolliest eyes you’ve ever seen. Your red hot eyes have burned through an awful lot over the years. I try to stay out of your gaze for fear of being singed. They singed a pair of brown brogues this morning. It was a most embarrassing situation to be in. Sometimes they sing whilst they singe. I’ve drawn a sign to demonstrate this. How singular. Have they ever singed a singing signor?